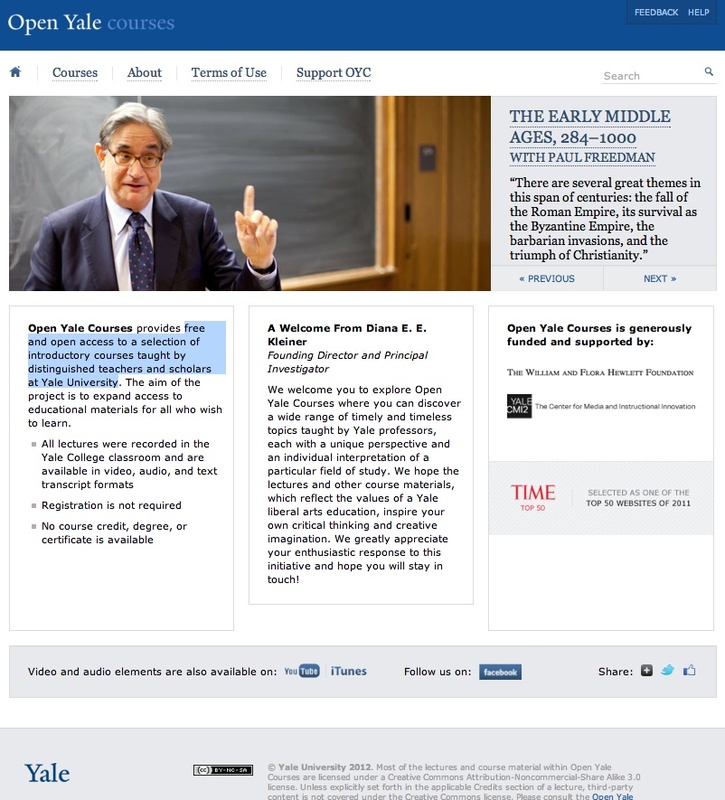 Open Yale Courses is a portal providing free and open access to a selection of introductory courses given by distinguished teachers and scholars at Yale University from 2006 to the present. The courses – 35 are currently available on the website – embrace a wide range of topics, from humanities and social sciences to physical and biological sciences. Political sciences is present with few but significant contributions, such as Ian Shapiro with his 25-lecture course on the Moral Foundation of Politics and Douglas A. Rae with 24 lectures on Capitalism, Success, Crisis and Reform. The contents are classified by department, each course including class lectures and other course materials, such as the syllabus, suggested reading, a download area and, in many cases, a study group. More than 850 lectures are currently available for viewing on the website. Video and audio-only versions are also downloadable, directly from the OpenYale Courses platform. All video and audio elements are also available on YouTube and the iTunes channel. A transcript of each lecture is also provided for free viewing and downloading. No registration is required. Yale replicates in the multimedia repositories the complexity of its disciplinary organisation, offering specialized portals for research centres or departments, such as the Yale Office of Public Affairs and Communication, the Centre for Study of Globalization and the Yale Divinity School.